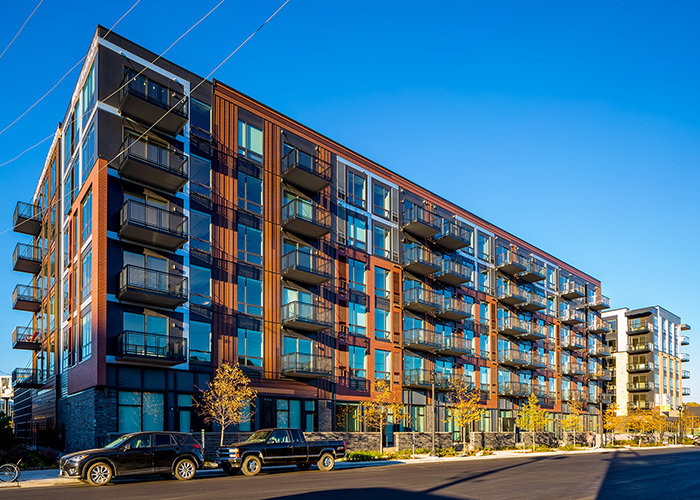 Junction Flats, a 242,000 square foot apartment building with integrated parking, is located just two blocks north of Target Field. Floors 2 through 6 consist of 182 apartment units, with parking for 186 vehicles, plus work/live amenities at ground level and another level of parking below grade. Amenities include a first-level lobby and courtyard, a second-level clubroom, fitness center, and pool terrace with grill station, and a sixth-level roof deck with fire pit and clubroom. Building structural systems are wood stick framing for the upper five residential stories, supported by precast concrete plank on precast inverted tee beams at the podium level (floor 2). The first level parking is precast plank on precast inverted tee beams. The level below is a concrete two-way conventionally reinforced slab supported on concrete pile caps. 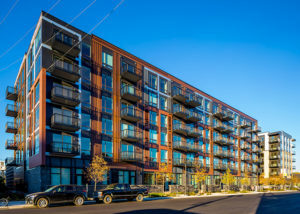 The precast columns, concrete foundation wall system, and reinforced basement slab are all supported on concrete pile caps and concrete filled steel pipe piles.